What a glorious morning is this. The liberties of our country, the freedoms of our civil Constitution are worth defending at all hazards; it is our duty to defend them against all attacks. We have received them as a fair inheritance from our worthy ancestors. They purchased them for us with toil and danger and expense of treasure and blood. It will bring a mark of everlasting infamy on the present generation enlightened as it is if we should suffer them to be wrested from us by violence without a struggle, or to be cheated out of them by the artifices of designing men. 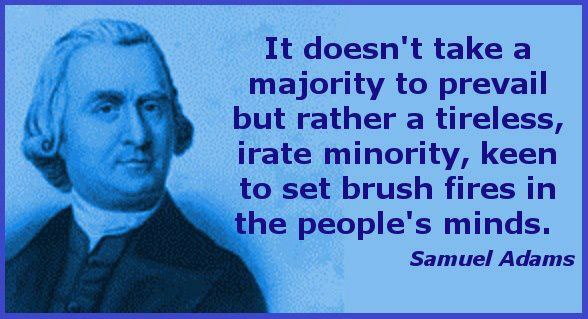 It does not take a majority to prevail but rather a tireless, irate minority, keen to set brush fires in the minds.